I have been looking for a Black Eyed Susan for a couple of years. Not sure why I couldn't find one...they are pretty common, I thought. My sister took me out a couple weeks ago for my annual birthday day out with her. It was so wonderful to hang out with her for the day. During the course of the day, she bought me two Black Eyed Susan's and a beautiful bright pink flowered strawberry basket. So beautiful. And a pretty geranium. Is that what is officially called "Rudbeckia"? If so, I planted one last year - it is called "Goldstrum". No flowers on it yet this year, but it's early days yet, and it did well last year. Hi Mark. 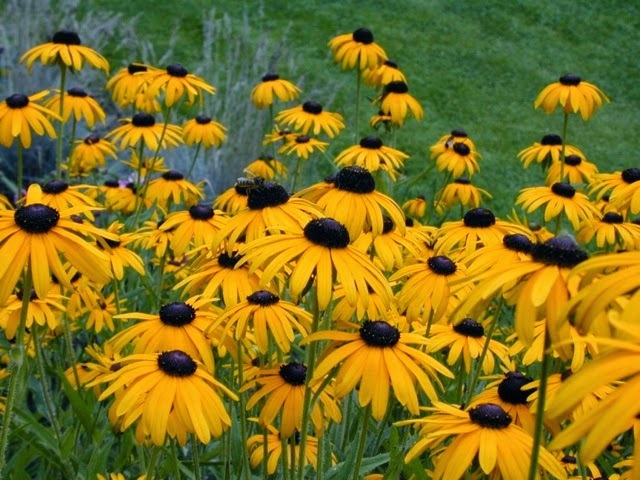 Yes it is a Rudbeckia. I love them. I'm going to look up your Goldstrum.